One recent sunny afternoon, my family and I were celebrating my dad’s birthday by enjoying a picnic at Glen Providence Park in my hometown of Media, PA. After savoring our awesome lunch from Desert Rose, we enjoyed an afternoon constitutional around the park’s pond and through the surrounding trails, where we observed the usual neighborhood assemblage of herps: Eastern painted turtles (Chrysemys picta), those invasive denizens of suburban parks, Red-eared sliders (Trachemys scripta elegans) , and an Eastern garter snake (Thamnophis sirtalis). On the long walk by up the hill, my mom’s attention was drawn to some movement in the undergrowth to the side of the trail. Thinking that only a mammal would be so obstreperous, I wandered over to see what all the (relative) commotion was about, and heard several muffled “meeps” indicating a distressed amphibian was in the area. 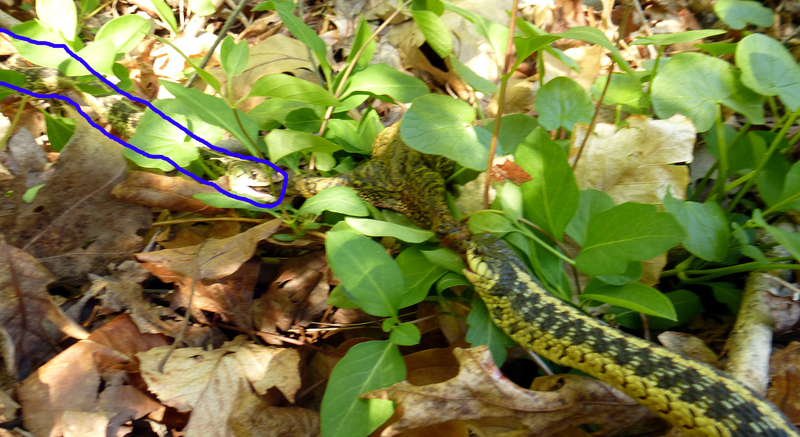 Looking down, I realized that a garter snake was in the process of consuming an American toad (Anaxyrus americanus). An American toad up to its waist in garter snake. But as I slipped my camera out of my pocket for a quick pic, something seemed wrong. 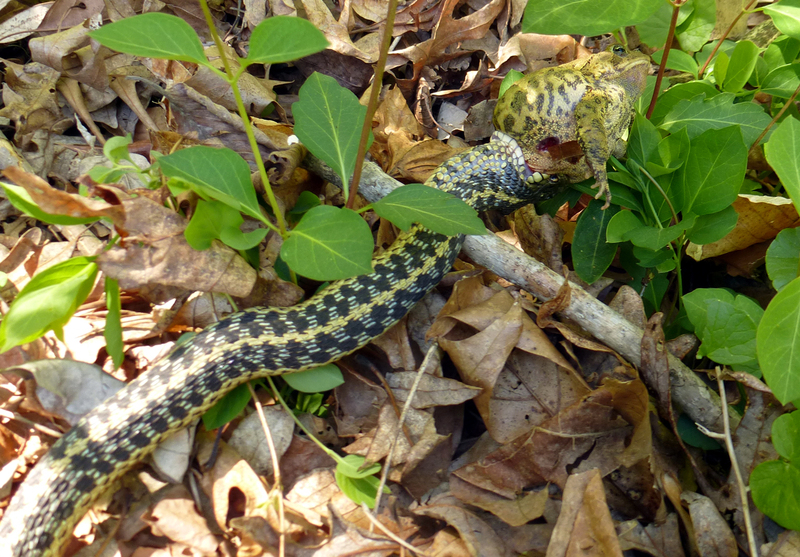 I saw at least 4 feet of garter snake, well above the record size for the species. As I hovered above, peering into the vines below, the snake which was in the process of devouring the toad’s leg rolled over, allowing me to see that there were in fact, two garter snakes, each of which had worked their way up a hind leg of the toad and were now vying with one another for control of the prey. I moved in with my camera as both snakes recognized that what must have seemed a much larger predator had arrived on the scene. I only had time for one quick and blurred picture before the snakes released their hold on the toad and quickly slithered away in opposite directions. Taking extreme measures to increase your flexibility in preparation for the Toadlympics can be a dangerous enterprise. In case you have trouble seeing both snakes due to my shoddy camerawork, I’ve made good use of my MS in Paint to outline the second snake for you below. After being released by both snakes, the toad itself seemed a bit dazed and bloodied, but appeared free of serious harm. I set him down in a cool, shady spot to recuperate, reflect on the ultimate fleetingness of life, and resolve to finally go on that once-in-a-lifetime trip to the next breeding pond over to see what the crowd down there has been trilling about. 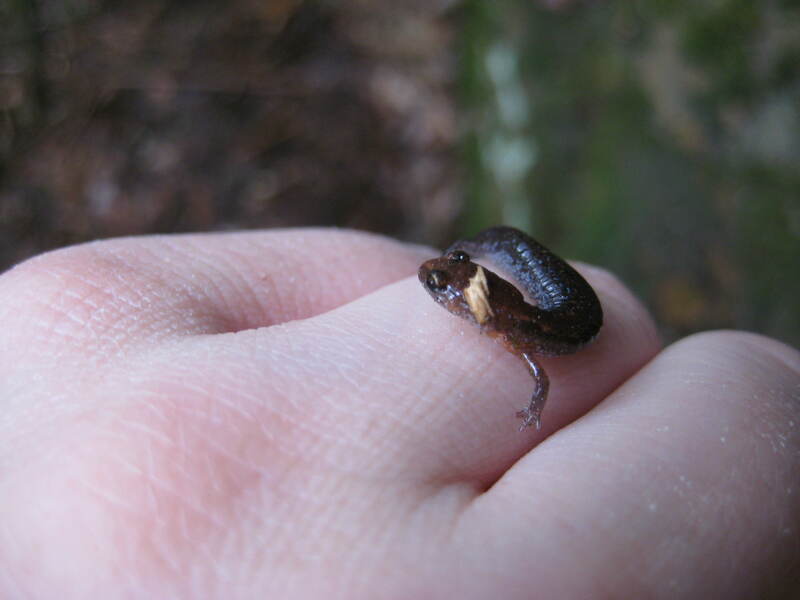 Categories: Fun in the Field | Tags: herps | Permalink. We’ve been working on a few projects during the past couple weeks. One of these projects focuses on the fire ants themselves. We want to know if fire ant behavior differs across their range. Meaning, do fire ants in areas where they have recently invaded behave differently than fire ants that have been in an area for many years? 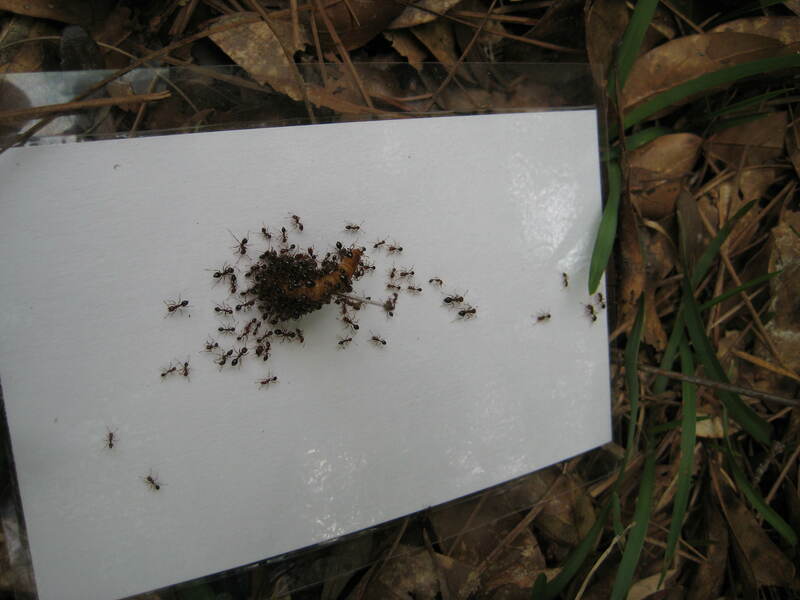 To investigate this, we have been testing fire ants at a variety of sites across the south. Fire ants love hot dogs. Fire ants are pretty keen on mealworms, too. We record the number of each species every time we check the baits. Chris and I are getting very good at estimating ant numbers! Chris checking baits. A concrete factory looms in the distance. One hypothesis is that fire ants are better at finding tasty food (a lizard, perhaps?) at sites where they have been for many years. I’ll have to do some number crunching to see if our data actually support this idea. The second experiment considers fire ant behavior on the mounds themselves. 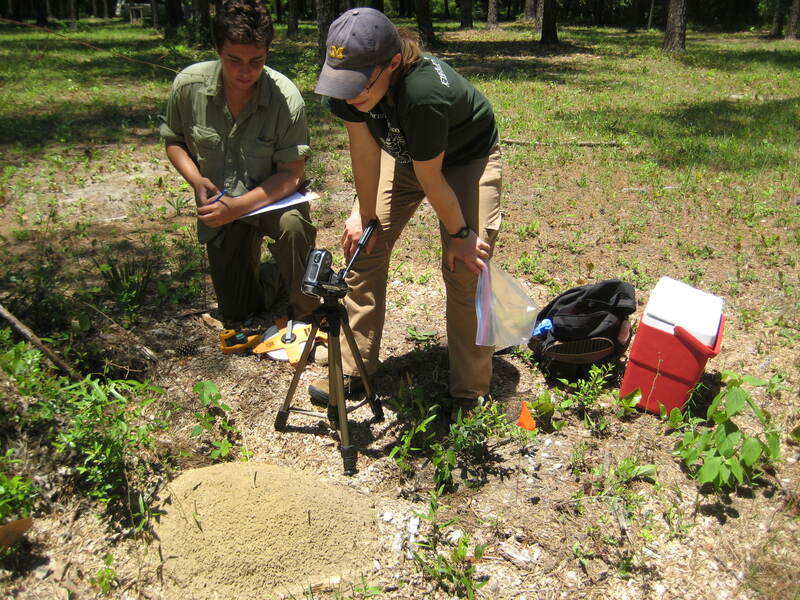 To see how good fire ants are at defending their mound, we record their responses to a novel object. Okay, so we poke a skewer into their mound. 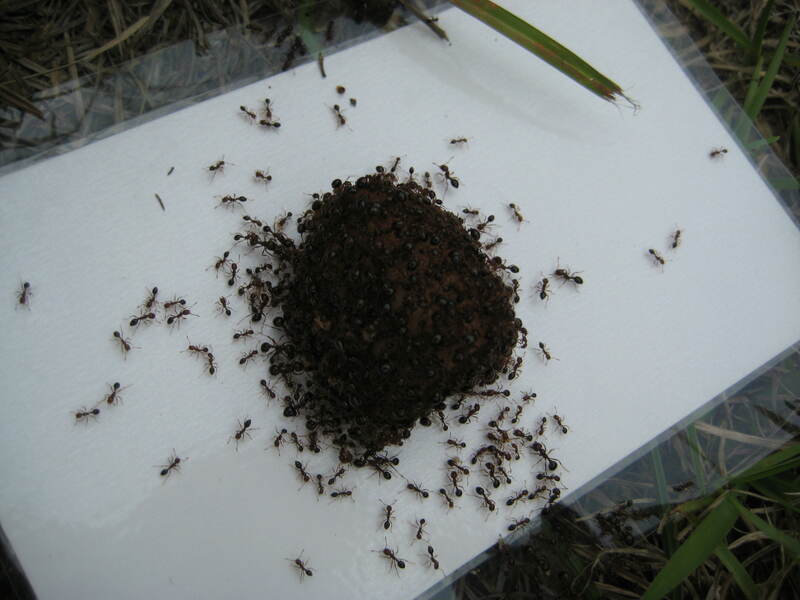 But by recording things like how many ants exit the mound and the time it takes to do so, we obtain valuable data on how aggressive fire ants are when defending. 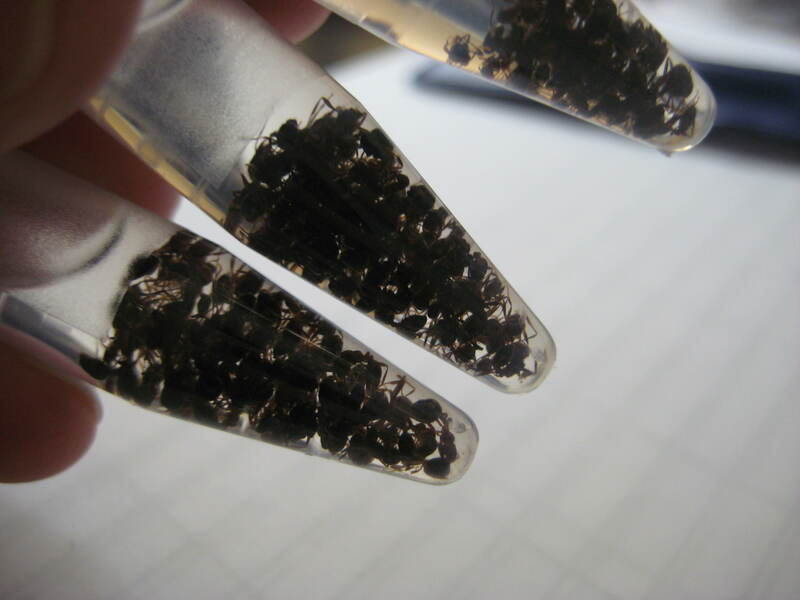 Are fire ants similarly aggressive across their invasive range? The boys have been graciously recording data for me when I poke mounds. Our undergrad Mark (who flew into Solon Dixon last week) has been a great assistant. Mark and Gail (that’s me!) testing a large fire ant mound. I’m also collecting fire ants from these mounds for molecular analysis. I’ll just save these for later. Another of our major projects this trip has focused on lizard behavior. Stay tuned for more details! Categories: Summer 2013 Field Trip | Tags: fence lizards, fire ants, native ants | Permalink. We’re well into our first field trip for the summer, and we have certainly kept busy! Chris, Sean, and I (Gail) began our lizard quest on May 6th. For the first week or so, we stopped at a number of our field sites in Tennessee and Arkansas (our fire ant “uninvaded” sites) to collect lizards. 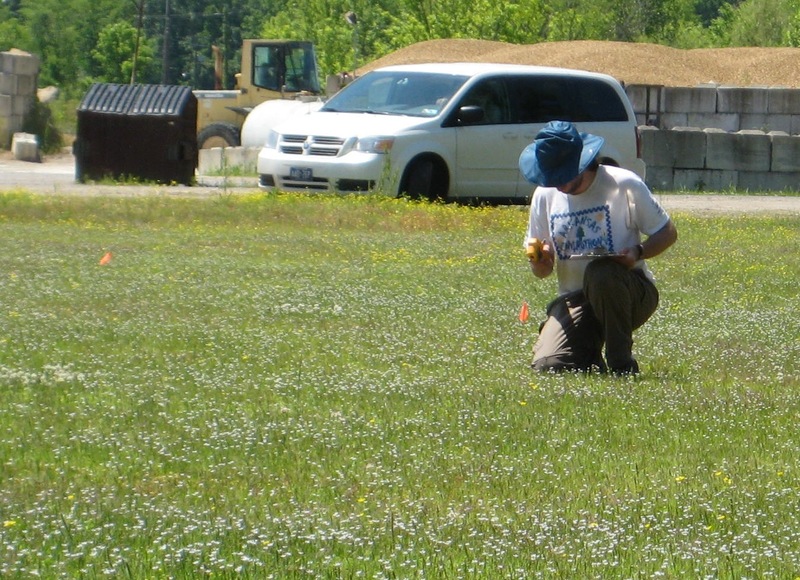 We also wanted some higher latitude sites with fire ants, so we checked out some new sites in Tennessee and Mississippi. The thing about new sites is, it’s often unclear where the lizards actually are. While much of the site may have great lizard habitat (so it seems to us), the only way to know for sure is to look! This means that collecting lizards at new sites often takes longer than usual. Our new Mississippi site surprised us, though. The boys caught all our lizards in about two hours! Awesome! Our new Tennessee site, however, wasn’t so fruitful. We did find some lizards, but not as many as we would have liked. The weather also wasn’t cooperating. Lizards love basking in the sun, but when there’s no sun…. 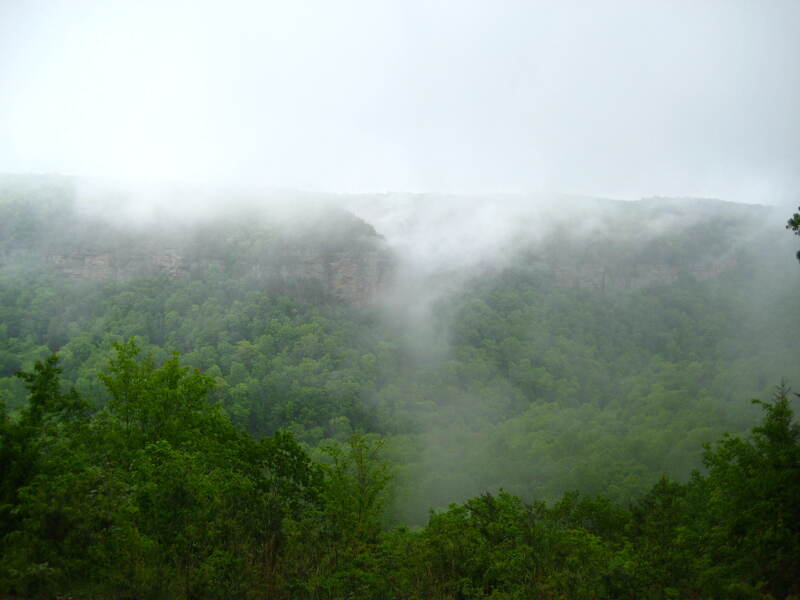 We drove out to Fall Creek Falls State Park (in TN) one morning to look for lizards, but the clouds came out in force on our way over. It was a bit wet and the sun was elusive, which is quite frustrating when lizard catching! Still, there was one perk to the clouds–we had time to investigate the falls! 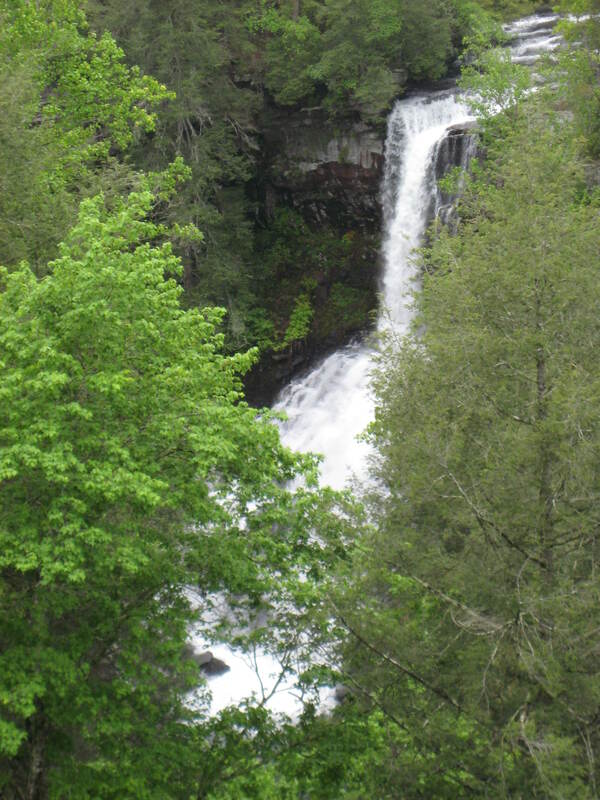 Fall Creek Falls has the highest waterfall in the Eastern US, with a 256-foot drop. The park also has two smaller (but no less beautiful!) 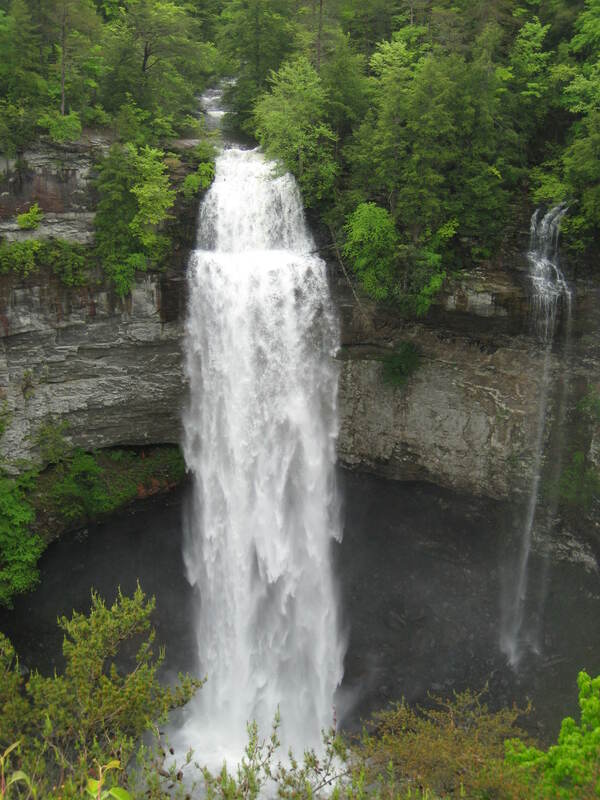 falls, Piney and Cane Creek Falls. 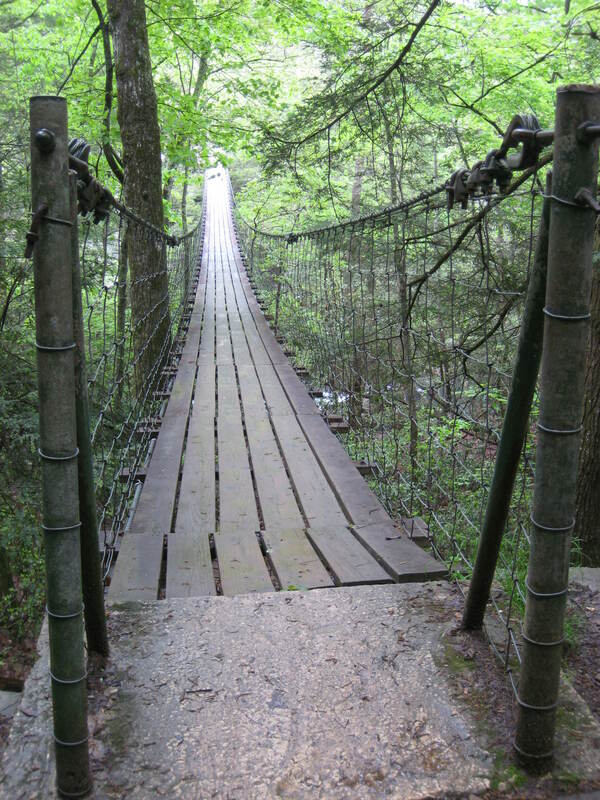 Just cross this wobbly suspension bridge for a better view of the falls! Even after we had properly taken in the falls, the sun was still elusive. What do you with your “free” time while on a Langkilde Lab trip? Herping of course! At least some herps were seen that day! More about our actual research coming soon! Categories: Summer 2013 Field Trip | Tags: fence lizards, field trip, herps, scenery | Permalink. On April 28th, at long last, the Langkilde Lab embarked on its oft-postponed Lab Field Trip. Most of the lab convened at 9 AM in the Beaver Stadium parking lot on a bright Sunday morning to pile into three station wagons and head North in search of fossils and hellbenders (living fossils!). 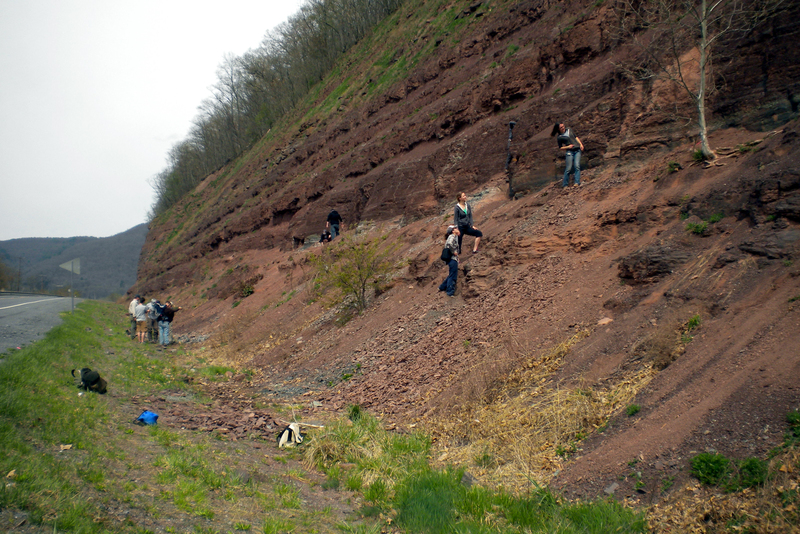 Our first destination was the Red Hill Site, a road cut near Hyner, PA that is administered by the Academy of Natural Sciences. 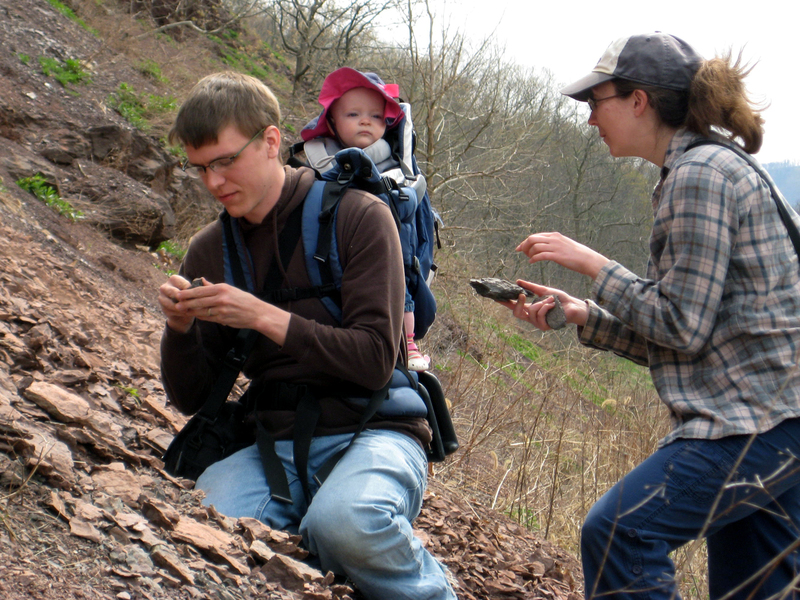 The Red Hill Site contains fossils from the Devonian period, the Age of Fishes. Previous finds at the Red Hill Site include lots of plant materials, but, more interestingly (to our lab at least), early tetrapods including some of those described in work by Neil Shubin and others. Any fossils from early tetrapods or Devonian fish were on our wishlist that morning, and the Red Hill did not disappoint! Soon after we had parked on the side of the road and hiked up to the cut, Doug Rowe, the manager of the site, pulled up and gave us great info on where to start our search (we had called ahead to ask permission to check out the site, as should anyone who wants to check it out, as it is an active research site!). Everyone dove right in to the talus slope, using fingers and the occasional hammer, to pull apart the thin layers of sandstone and mudstone and peek between them to see if any fossils were present. Doug helped ID our finds and showed the amazing ability to identify rocks that were already laying around that contained interesting fossils. We found lots of plant material including charcoal from ancient forest fires that left our fingers black. After searching for a while, we did turn up some very cool finds: Renee spotted a fish spine, several folks found fossilized fish scales, and Sean and I both uncovered ancient fish teeth. Even Darren and baby Nora (Brad’s F1) got into the act, enjoying the beautiful weather and abundant rocks for collecting. 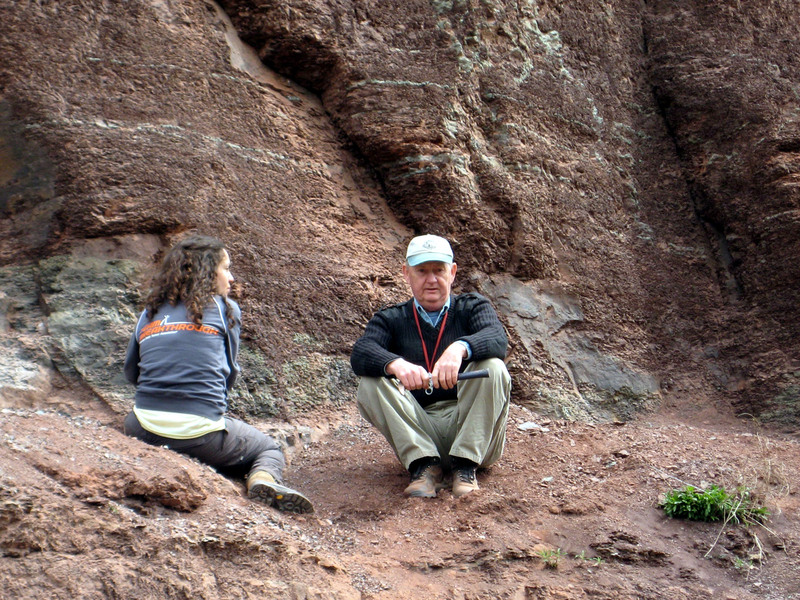 Doug Rowe and Jenny discuss the finer points of fossiling. Sean shows off his long-sought find: a Eusthenopteron tooth! Fossil-hunting was hard work, so we headed up to Hyner View State Park, for a well-earned lunch break. We wound our way carefully up the narrow route onto the bluffs as it twisted and turned like a hellbender in a stream. 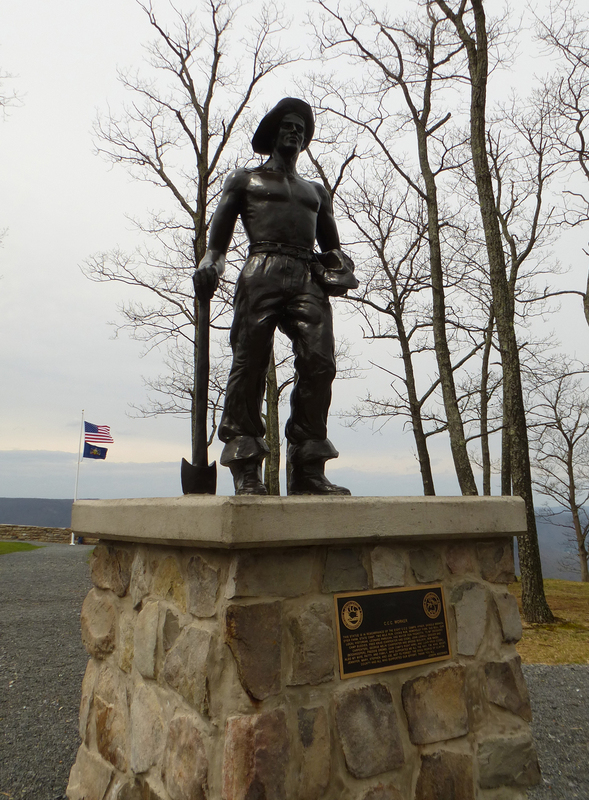 Once on top, we were treated to a gorgeous, panoramic view of the valley of both the western branch of the Susquehanna River below, as well as a finely-sculpted, ripple-muscled specimen of an axe-wielding logger. The panoramic view from the Hyner Overlook. 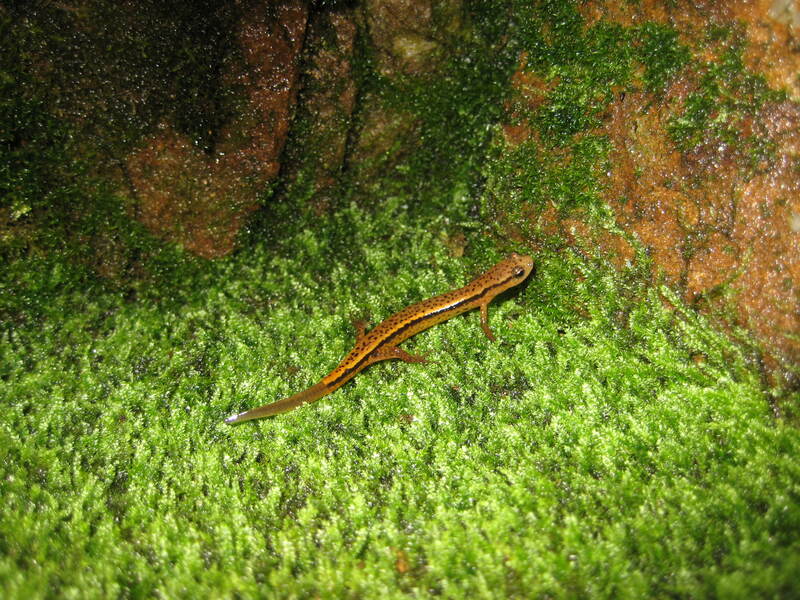 While these “snot otters” are rarely seen moving on the streambed, we aimed to find one via determined searching underneath large, flat rocks in Kettle Creek, at a site Sean led us to where he had been able to dredge up hellbenders before. Upon arrival, Sean asked for volunteers, with Jason and Jennie, the two lab interns, and me answering the call. Hunting for hellbenders involved splashing into the just-above-icy-cold creek and searching for likely rocks. Chris, Sean, Jennie, and Jason hellbender for all they’re worth. Sean and I would reach down into the swirling water, search for a strong handhold along the slippery, algafied edges of the stones, and heave up on the count of 3. Jason and Jennie, standing with dipnets just downstream of the lifted rock, swept their hands underneath the rock, attempting to drive any potential hellbenders into the waiting nets. 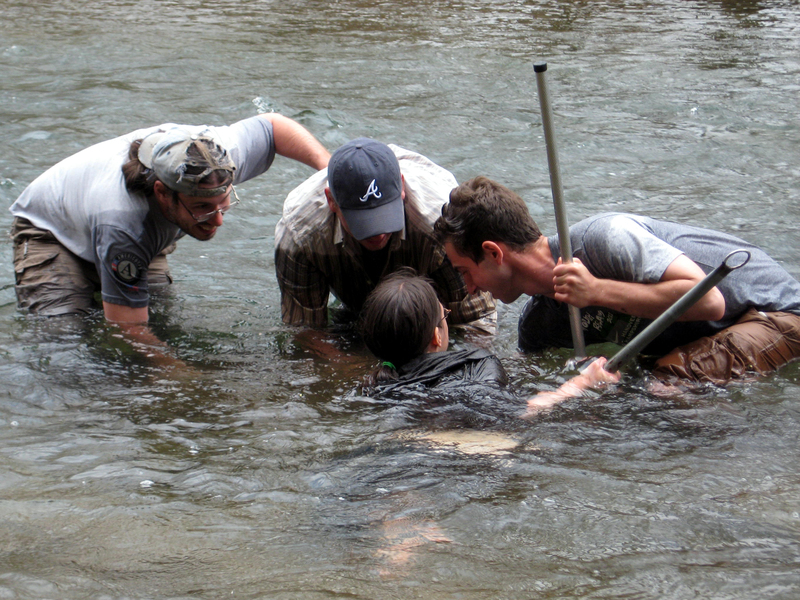 Our team worked our way through a 200 meter section of the stream, but found only one hellbender, which managed to elude our carefully placed nets. Argh! After an hour in the creek, Sean, Jason, Jennie, and I were thoroughly chilled, but had had an awesome time in spite of it all. Fortunately for us, Darren saved the afternoon by catching a crayfish and looking incredibly good doing it. The whole group packed by into our Subaru Forester Armada for the long drive home, discussing when we would make another attempt to capture the elusive hellbender. Darren proudly displaying his crayfish find! 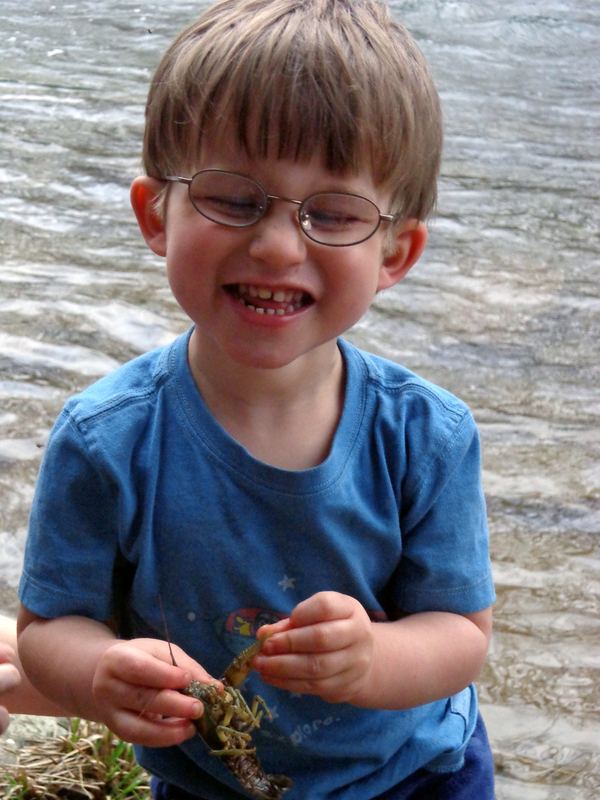 Categories: Fun in the Field | Tags: field trip, fossil, hellbender, herps, scenery | Permalink. We finally decided to switch to an ongoing blog instead of creating a new one each summer. Hopefully this will make it easier to follow our research. We also hope to update about other work in the lab, not just the summer projects. Stay tuned for updates from our recent lab adventures in Pennsylvania as well as from the beginnings of our first 2013 trip south! 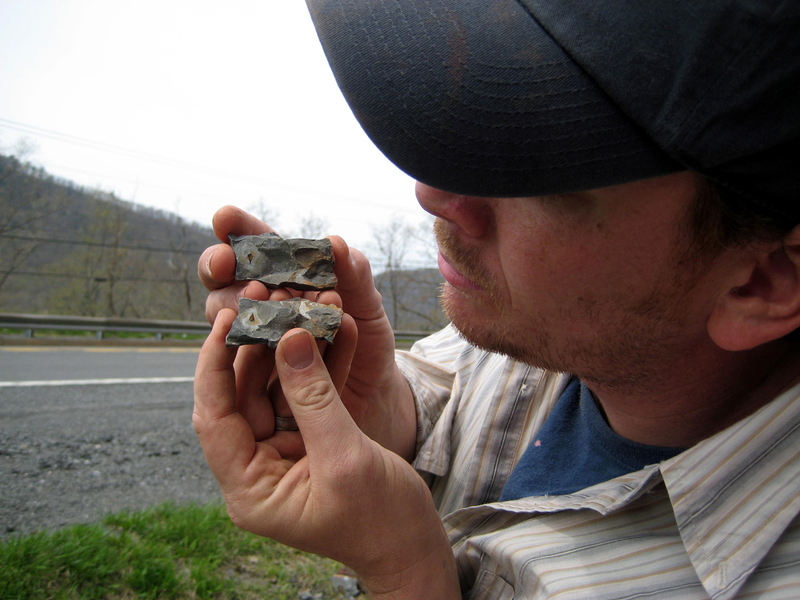 Blog posts from our 2011 and 2012 field blog have been moved here for archive purposes. Unfortunately comments don’t carry over, but you can always check out the originals at the links above. Categories: Lab News | Tags: blogging | Permalink.